Even the most ardent city lover has to get away sometimes. To a place where the sun feels warm, not oppressive. Where breezes smell sweet and not full of dust. Where the night sky is a black sheet dotted with thousands of tiny pin pricks of light, not something hidden behind an neon-orange glow. A place where horizons expand out of sight, across fields and oceans, where dreams are not contained or crushed by concrete and asphalt. But the city always calls you back. The electric buzz hums down the line, and time ticks back around to its normal rhythms. The track that takes you out of the city is the same one that brings you back home. 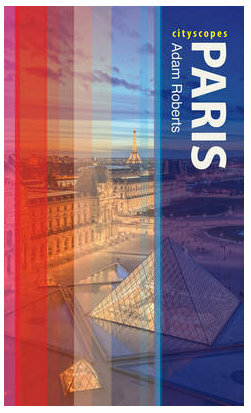 I'm an architect and occasional visitor to Paris. I have always loved your unique view and great writing. This post is absolutely fantastic. Somehow it resonates with me, similar places I have experienced, and thoughts I have had. Please keep it coming. It's mostly nice to leave for somewhere ... and to come back. ... and rail is a nice way of doing it! 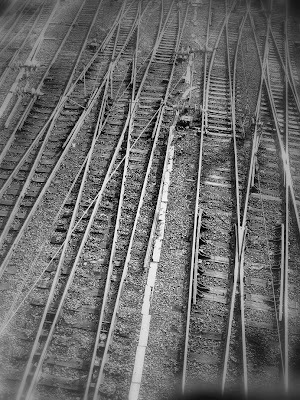 The tracks are complex, the switches determine where you go. Paris is like that, full of switches. Depending on which way you go you arrive at a completely different Paris. Nice image! I love the "poetry" of this post.